Passengers travelling from Heathrow face continued disruption as thousands of people tried to rebook flights cancelled following a security alert. Terminal 4 was partially evacuated when a suspect bag was seen on Tuesday. Airport staff were operating a queuing system outside the terminal to ease overcrowding inside, as people returned to rebook or catch rescheduled flights. Airport operator BAA said it did not know how long it would take to get operations back to normal. But the airport said it check-in and security clearance times were operating normally. 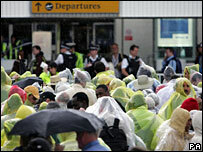 A spokesman said: "Terminal 4 is very busy today as a lot of people have come back who were turned away yesterday. "There is a degree of congestion outside the terminal but it is not affecting check-in times or the length of time needed to clear people through security." British Airways also erected marquees to provide extra booking desks and shelter from the weather. The Metropolitan Police said an item was identified at the terminal at about midday on Tuesday but "nothing significant" was found after a search. International flights were cancelled until the evening and European flights were cancelled for the rest of the day. Departing passengers faced long delays as airport officials began re-screening them. The alert came after failed terrorist attacks in London and Glasgow.